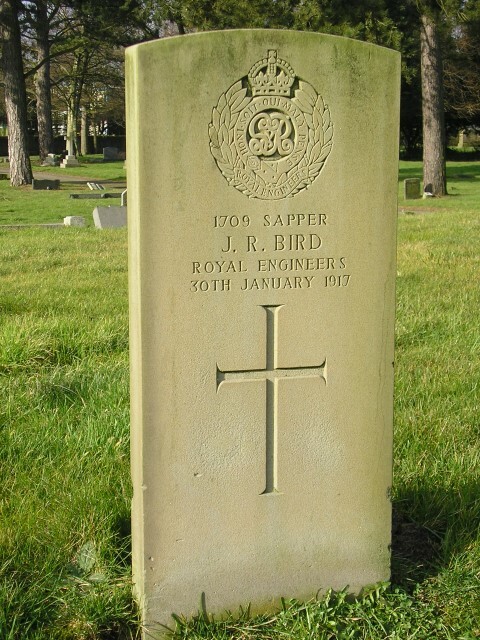 1709 Sapper J.R. Bird, Royal Engineers died 30 January 1917 and he is buried in West Auckland cemetery, County Durham. He was 33 years old, husband to Edith and they had 3 children. He is commemorated on the St. Helen’s Colliery Memorial Cottages and West Auckland War Memorial. The family lived at 3 Peverell Street, South Church, Bishop Auckland and John worked as a “house joiner.”  Since he is recorded on the St. Helen’s Colliery Memorial Cottages, he must have been employed by the colliery owners Pease and Partners at the outbreak of war or a later date. 1709 Sapper J.R. Bird served with the Northumbrian Division, Royal Engineers. To date, no further military information has been traced. It is assumed that his skills as a joiner were required by the Royal Engineers. 1709 Sapper J.R. Bird died at home whether of natural causes, injury or wounds suffered in action overseas remains unknown. He is buried in West Auckland Cemetery.